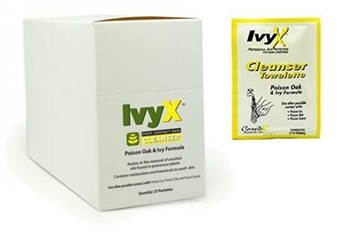 IvyX Poison Oak & Ivy Cleanser Towelettes 25/bx. Apply after contact with poisonous plants to cleanse skin of irritating oils. Strong enough to remove the oils of poisonous plants. Moisturizes and soothes damaged skin. 25 packets per box.